(Inside Science) -- Particle physicists from Italy and the U.S. have come up with a new way to analyze data from the Large Hadron Collider, or LHC, that may help future efforts to discover new particles. The LHC, located near Geneva, Switzerland, is the world’s biggest and most powerful particle accelerator. It makes new particles -- most famously the Higgs boson -- by hurling protons traveling at near the speed of light toward each other. Einstein’s famous equation, E = mc2, says that mass and energy are two sides of the same coin. Because of this equivalence between mass and energy, the LHC can only make particles that are lighter than the amount of energy it can pump into these colliding protons. When the LHC produced the famous Higgs boson, it was running at 3.5 teraelectronvolts, or TeV, per beam. That means that each proton inside the LHC’s 16-mile-long tunnel was accelerated to the point that it was carrying more than 17,000 times the average energy released by a uranium atom during a nuclear explosion. In comparison, the Higgs boson has a relatively modest mass of 125 gigaelectronvolts, much smaller than what the LHC was theoretically capable of producing. Still, the LHC had to run for a full two years before scientists had accumulated enough data to say with confidence that they had finally found the Higgs boson -- if you are trying to win a Nobel prize, you need to make sure that the blips in the data are real and not statistical noise. "In principle the LHC can produce anything that's less than its energy. The problem is that the rate at which the LHC produces those particles is very small," said Eram Rizvi, a particle physicist from Queen Mary University of London in the U.K. who was not involved with the new study. When two beams of protons -- each tens of billions strong -- fly past each other 10 thousand times a second, actual collisions between two protons are relatively rare, occurring at a rate of a few hundred million times a second. Out of the millions and trillions of collisions, one that can produce a particle as heavy as the Higgs boson only happens about a billionth of the time. If scientists needed two years just to confirm the detection of the Higgs boson, they will have an even harder time hunting down anything that's even heavier. One approach is to upgrade the LHC, which they did between 2013 and 2015. The LHC now runs at 6.5 TeV per beam. A complementary approach is to come up with alternate ways to analyze the existing data. 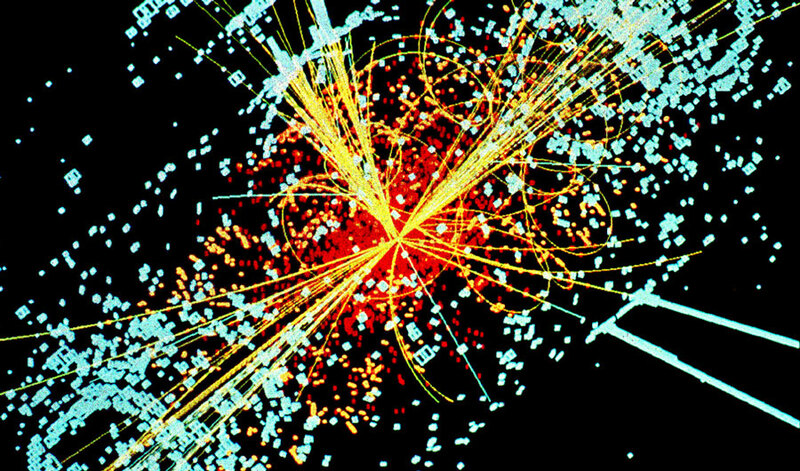 The Higgs boson showed up as a "bump" in the LHC data. The new study suggests it’s also possible to detect particles by looking at a subtler effect called quantum interference. "Basically, it's another way a particle can manifest itself even if it's too heavy for the LHC," said Josh Ruderman, a particle physicist from New York University and one of the authors of the paper, which is published in the journal Physical Review Letters. "We won't be looking for a big dramatic bump, but it would be a small change in the shape of the data," he said. Instead of looking for new particles directly, Ruderman and his colleagues think that scientists can find hints of a new particle by looking for effects it may have on the distribution of the lower mass particles produced by the LHC. If the direct detection method is akin to trying to locate Waldo among a sea of people, the new method teaches us how to find Waldo by looking at how the other people react to Waldo -- even if the man in the striped shirt is himself invisible to the reader or located off the page. Rizvi thinks that this new method can potentially find particles with masses between roughly 1-5 TeV. Particles lighter than 1 TeV can be detected directly, and particles heavier than 5 TeV can already be indirectly spotted using several existing models, through a phenomenon known as "quantum perturbations," Rizvi said. After the LHC's discovery of the so-called "God particle" -- a nickname actually detested by many physicists -- what's still left to be discovered? "People actually have lots of ideas for what kind of new particles there can be," said Ruderman. For instance, new particles might help explain dark matter, he said. "But really, it's mostly an exploration game."